This quest page is currently being rewritten as part of the Morrowind Overhaul Project. Find the supposedly mad Sotha Sil in his hidden Clockwork City for Almalexia. Speak with Almalexia and she will teleport you to the Clockwork City. Move through the Clockwork City, avoiding the variety of traps found there. Note that teleportation and levitation magic will not work in these areas. In the Dome of Serlyn, flip the right switch when the machine begins to make a Fabricant to pass through. Kill the large Fabricant in the Dome of the Imperfect. Find the body of Sotha Sil in his Dome. Encounter Almalexia when you try to leave. Fight Almalexia and kill her (don't forget to soultrap). Loot her body and equip the Mazed Band to teleport back to Mournhold. Exit the Temple and speak with Azura to finish the Tribunal Main Quest. (Optional) Report back to King Helseth for his thanks and a set of Royal Guard armor. Speak to Lady Almalexia in the High Chapel, once the Trueflame blade has been reforged and she will tell you of the third Tribunal god, Sotha Sil. Apparently, the god has become mad over the years tinkering in his Clockwork City. Almalexia believes that he must be stopped, as he is a danger to all of Morrowind. The Trueflame blade is capable of killing Sotha Sil and, of course, it is up to you to do so. When you are ready, the Lady will teleport you to the Clockwork City. 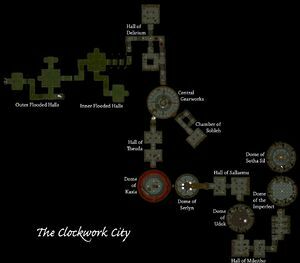 Note: Once you go to the Clockwork City, you will be stuck there until completing the quest (recall and intervention spells will not work). Make sure that you have everything you need, before telling Almalexia that you're ready. The Dome of Kasia contains a trap that requires quick feet to evade. If you look up, you will see a huge, rotating mechanical arm with a saw at its end. As soon as you step onto the balcony, from which you must access the door in order to progress, you are in danger of being hit by the saw, which will kill you instantly. In order to run around to the door quickly enough to avoid the saw, you will need to use Fortify Speed effects in order to increase your running speed. The elixirs dropped by Verminous Fabricants fortify speed, and you will probably have to drink several of them in order to beat the saw. You will need more than 130 points in speed (135 works fine) in order to make it. Another way to get past this trap is to use a Jump or Fortify Acrobatics spell/potion (e.g. the Scroll of Icarian Flight) and jump from the floor onto the ledge. There's a short puzzle in this small area with two levers and a machine that makes the Verminous Fabricants. The left switch opens the front door and the right switch opens the back door; however, you cannot operate both at once. The trick here is to flip the right switch to open the back door, then flip it a second time to close it, then open and close the front door. When the machine starts making noises and the tubes overhead move, open the back door again. The front door then will open automatically to release the Fabricant, leaving both doors open, and you will have a few moments to pass before the front door closes again. Note: if you want to trap the soul of a Verminous Fabricant, this is the only moment you can. Only the Verminous Fabricants made by this machine have a soul that you can trap. Upon entering this area, you will see a large chasm filled with lava separating you from the door. To your right is a 'rusted lever' which requires a Strength of at least 100 to operate. Unless your strength is already at maximum through leveling up, you will need to use Fortify Strength effects in order to push the handle down. Fortunately, the Hulking Fabricants carry an elixir which fortifies strength, but unless you have already obtained enough to increase your strength above 100, you will become trapped in this area, as there is no way back through the Dome of Serlyn. Once you have activated the lever, the bridge is constructed and the way to the door is cleared. An alternative (though difficult) option is to run around the narrow rim towards the door. If you run around the side to the left of the way in (the side with the verminous fabricant), you should be able to jump onto the bridge. Alternatively, a spell or potion of jump can be used to jump across directly. From here, there is a small gap between the bridge and the wall, on the right-hand side. Through this, if you position yourself correctly, the door can be selected and traveled through. You will see two giant Dwemer-like statues guarding the exit in this small dome. While they both look static one of them is in fact active and will attack you when you move close enough (you can see the shadow of the active one if you have them enabled). The construct is called an Imperfect and it offers quite a fight in this confined space. Imperfect is magic resistant, casts a nasty shock spell and hits very hard. Use whatever strategy you like to defeat it. The Imperfect is quite slow so you could use spells from afar then move in for the final blow. Note that you will be unable to enter the Dome of Sotha Sil until the Imperfect has been killed. Now, take a little breather before entering the next room. The next fight is against the toughest single opponent in Tribunal, so make sure you are ready. When you enter this Dome you'll find the lifeless body of Sotha Sil. Activating his remains will yield an onscreen message: "You have found the body of Sotha Sil, his lifeless hulk dangling from a contraption of his own making. Someone has obviously been here before you." Now that your job appears to have been done for you, all that's left to do is go back home and tell Almalexia that Sotha Sil is dead, right? Well, not quite: when you try to leave the Dome, Almalexia will appear before you and launch into a long speech. From her ramblings, it appears that Almalexia really is the one who has gone mad from the loss of her divine powers, not the late Sotha Sil, and now it is your job to die as a martyr. She reveals that the Fabricant attack on Mournhold was in fact her doing, with the aim of appearing to save the city from the disaster which she in fact caused, thereby rekindling the love of her people. Once her speech is done, the fight is on. Almalexia is no pushover (she's a living god after all), since she has impressively powerful spells, magic resistance, speed, and Hopesfire, which packs a mighty melee punch. Try to dodge most of her spells, although Spell Absorption and Reflect spells/enchantments can make this less necessary. If you have Azura's Star don't forget to cast Soultrap on her before delivering the final blow, since her soul has a whopping charge of 1500. 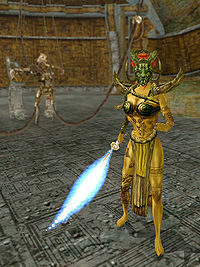 Once Almalexia is dead, you'll receive another journal entry and you can recover from her corpse the Hopesfire Blade (similar to the Trueflame but with shock damage) and the Mazed Band which summons a Fabricant for 2 minutes as well as allowing to you to teleport to Vivec, Mournhold, or The Clockwork City. Equip the Mazed Band and teleport back to Mournhold; you cannot teleport anywhere else at this time. Exit the Temple and you'll be once again greeted by Azura. She confirms what you already might know: it was Almalexia who was mad and not Sotha Sil. She also rids Mournhold of the ashstorms as her "gift to the Dunmer people". You can return to both King Helseth, to let him know what you've discovered and receive a full set of Royal Guard armor (as part of his quest), and Vivec, to hear his thoughts about the future of Morrowind. You can try to tell people what happened, but almost no one will believe you, and they will lose disposition points while shunning you or believing you to be insane. Azura will refer to you as the Nerevarine, even if you haven't progressed far enough in the Morrowind main quest to be declared the Nerevarine. If you've already completed the main quest, you can discuss Almalexia's death with Vivec. Almalexia's soul is the most valuable item in the game at 7,500,000 gold (next is Vivec's at 5,000,000). The soul has the highest Enchantment value in the game, making it useful for a cast-on-strike weapon. After this quest, the mysterious force locking the controls to the weather machine in Bamz-Amschend dissipates, allowing you to use the machine to control the weather in Mournhold. If he still lives: "None may stand in my way. Not you, and certainly not Vivec. He is a poet, a fool. I will deal with him when I have finished with you. And Sotha Sil...he always thought himself our better, shunning us, locking himself in this hole. He spoke not a word as he died. Not a whisper. Even in death, he mocked me with his silence! But I think you will scream, mortal. For now, you face the one true god." After the battle and the visit from Azura, you get the dialogue option of "Almalexia" with most people in the game where you can tell them that: "I found Sotha Sil dead, and killed Almalexia." or lie and say " I found Almalexia, Sotha Sil, and Vivec dead." or "I found Sotha Sil dead and killed Almalexia and Vivec." No matter which one you choose, most people will not believe you and their disposition towards you will drop. The only three who will take your word for it are King Helseth, Barenziah, and Vivec. Galsa Andrano believes it plausible since she was doubtful from the beginning. The Dome of Serlyn may be pitch black. This 'darkness' cannot be counteracted with light/nighteye/resist or any type of spell. Use the editor to set the nif value to 1.0 for the fog, in order to solve the problem. This is likely due to a specific video card problem. Alternatively, you can open the console and enter "ts" (for "Toggle Sky"), which will 'switch' the lights back on when you close the console. The Verminous Fabricants may multiply to numbers exceeding ten and when the door opens they attack and kill you. This may be caused by 'fiddling' too much with the control switches, releasing and then trapping numerous creatures at once. In Almalexia's speech she talks about Sotha Sil being in "his hole" but the subtitles say "this hole". Though teleportation magic doesn't work, scripted teleportation items, such as the Daedric Sanctuary Amulet, will function as normal. Almalexia's dialogue topic "must be stopped" becomes unavailable upon entering the dungeon, and since the player can't cast Mark in the Clockwork City, exiting in this manner makes it impossible to return unless the Mazed Band has already been taken from Almalexia's corpse. ? Saving and loading after Almalexia has begun attacking will set her magicka to 200 instead of 1500. This gives her enough magicka to cast her spell only once. ? The following Quest_ID and Index codes can be used with the Journal Console command to manually update the quest to a certain point. 10 Almalexia has one final mission for me--to stop Sotha Sil. She tells me that the god has gone mad, and that he is the creator of the Fabricants that attacked Mournhold. The goddess will transport me to Sotha Sil's Clockwork City. There, I should try to reason with Sotha Sil, though Almalexia believes he is beyond reason. If he will not be swayed, I am to use Trueflame to end his life. 20 I have been transported to Sotha Sil's Clockwork City. 50 I have found the corpse of Sotha Sil. The god's body has been ravaged by powerful forces. 70 Almalexia has appeared in the Clockwork City, and revealed all. Using the dimension traveling powers of the Mazed Band, Almalexia traveled to the Clockwork City to slay Sotha Sil and to portal the Fabricants to Mournhold. She believes the time of the Tribunal is ended, and she alone may usher Morrowind into a new era as the one savior of her people. I fear it is Almalexia who has gone mad, and not Sotha Sil. 100 Finishes quest Almalexia is dead at my hand. The goddess hoped to leave me here dead, and make me a martyr to her new cause. Now, she and Sotha Sil both lie dead in what is left of the Clockwork City. 110 I have returned to Mournhold and been visited by the spirit of the Daedra Azura. She has told me that the death of Almalexia was just, and that it was she, not Sotha Sil, who was mad. The time of the Tribunal, says Azura, is gone. As a sign of her love for the Dunmer, she has ended the ashstorms in Mournhold, and promised they will never return. This page was last modified on 15 November 2018, at 23:06.